This past week Microsoft announced several additions to Hotmail in order to better compete with Gmail. Â No, I am not changing this from the Gmail Podcast to the Hotmail Podcast. We Gmail users snickered because many of these features like conversation view, and one-click filtering have been in Gmail for years . Within hours of the Microsoft announcement, Gmail upped the ante by announcing an API, or application programming interface, to allow developers to create contextual gadgets. Contextual gadgets allow you to interact with traditional non-email data without leaving your mail application. You may already be using contextual gadgets and not even realize it. Examples include YouTube, photo, and document previews. 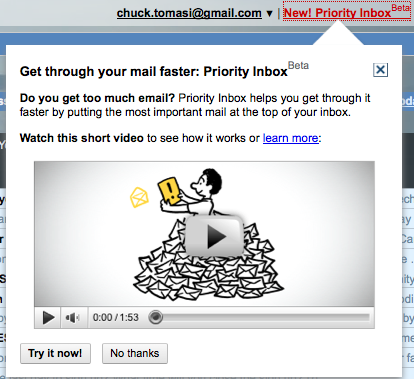 Watching a video within email is not something email was originally designed to do so Google thought it would be a great idea to look for YouTube (and similar links) and provide the information right in the message so you don’t have to click and switch to another browser window or application, then come back to manage your email. Now these features is available to developers outside the Google Domain to extend the functionality of Gmail. Several already exist such as AwayFind that allows you to mark certain contacts or messages as urgent and flag the recipient can be alerted via phone, SMS, or IM. Contextual apps are available for those who host their domain with Google. For example, I can add AwayFind as an available feature to those with chuckchat.com email addresses because the chuckchat.com mail is hosted on Google. The only information I could find at this time regarding the installation and activation of these apps was an article on CNet.com that Google Apps Administrators can install the contextual gadgets for their users. When I logged in and went to Manage my chuckchat.com domain, a button appeared on the Dashboard near the top just below the menu bar that said “Continue with setup guide”. When I clicked on it, I was brought to the Google Apps Admin Help screen that has a link at the top to the Google Apps Marketplace. If you want to just look around, use google.com/enterprise/marketplace. I went ahead and installed and configured AwayFind so I can be alerted via SMS to my Google Voice number when important messages come to a specific domain. It only took a few minutes and is nice to have for certain cases. I can manage the contextual app from the main control panel of the dashboard. While doing research for this article I noticed that labs are now available in Gmail for hosted domains while themes are not yet an option. One final thing, Google Calendar got a minor update this past week for the first time in a while. The changes may appear subtle at first. They include some tweaks to the fonts and colors to make them a bit sharper. If you use tasks in Gmail and Calendar, take note that the Tasks link in Calendar has been removed and replaced with a listing under My Calendars. When you turn this pseudo calendar on, the tasks will appear on the right hand side. 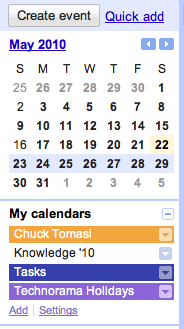 Managing the tasks in Google Calendar is the same as in Gmail. See the Gmail Podcast archives for more information on tasks. It’s time to take a look at maintaining your Gmail security. It’s no secret that the Internet can be a dangerous place. Fortunately, you don’t have to be an IT security geek to protect your Gmail account. With a few simple, common sense steps, and a little familiarity of some key Gmail features, you can protect yourself from people trying to gain access to your account. You know the story. You get an email from a friend of yours who is reported to be stranded overseas and needs a couple hundred dollars to get home. This is one of the common messages and, of course, completely false. Your friend’s email account has been compromised, he’s got no idea until it’s too late, and your name happened to be in the address book along with who knows how many others who got a similar message. Remember, they wouldn’t be doing it if it didn’t work at least some of the time. How do you prevent yourself from the same fate as your friend? (Not the ‘getting stuck overseas part’). The first step is understanding how your account could be breached. One way is forgetting logout on a public computer (a hotel kiosk for example.) Another way would be if someone had installed keylogging software on the computer you used. While undetectable to you, there are steps you can take to mitigate the risk. Second, remember to sign out when you’re done. It sounds simple, but it’s easy to forget. Third, monitor any open sessions and understand what they mean. At the bottom of the main conversation index, there’s a line that says “Last account activity” and a link at the end to display the details. If you, or someone else, is logged on from another computer, it will tell you there. I often see one or two other computers logged in because I forget to logout on my home computer then access Gmail from work. By clicking on the Details link Gmail displays the location and IP addresses of the other sessions, a button to terminate the other sessions immediately, and a history of recent activity. It’s a good idea to become familiar with your home and work IP addresses so you can spot others that you don’t recognize. Remember to periodically scroll to the bottom of the screen and see how many other seessions are going. If it’s one or more, have a look at the details to be safe. Finally, Gmail has created a feature that removes some of the burden of monitoring your activity. If Google sees activity on your account from two different countries within a few hours, you will see a warning message at the top of the screen in red which starts out “Warning, We believe your account was last accessed from…” You can turn this setting off from the same Activity history details mentioned earlier, but I don’t recommend it. Hopefully you’ll never see this message. While it’s nice to know Gmail is helping with some of the security, it doesn’t relieve you from doing some of the measures mentioned earlier. Welcome to part 3 of our 3 part series on texting from Gmail and Google applications. If you haven’t listened to parts 1 or 2, you can download them from iTunes or listen directly from the Gmail Podcast blog at chuckchat.com. That information is not required for this podcast, but it makes for a more complete picture of what you can do with Google applications and text messaging. In parts 1 and 2 I showed you how to send free SMS messages from Gmail and Google Voice. In this part of the series, I cover how to send SMS messages to Google Calendar to quickly create appointments. Let’s say I want to meet a friend for lunch tomorrow. I simply send a text message to GVENT (48368) with a message “Lunch with Bill at The Point tomorrow noon”. The text message gets sent to Google and put in your calendar. When the appointment is put on your calendar, you receive a text message confirming your appointment. There are several ways to construct your message. If you remember “who”, “what”, “when”, and “where” you should have no problems. Only “what” and “when” are required. The message format follows the same rules as the Quick Add feature in Google Calendar. The “what” is any text. The event title is created from this. “When” is the date and time of your appointment. Leaving the time off makes the appointment an all day event. Using the words “at” or “on” can help Google recognize the when. By default, Google calendar creates one hour appointments. You can optionally specify start and end times or a duration. You can add people to the guest list if you include “with” and one or more email addresses. Where is also any text following an “at” or “in”. I use this feature all the time and absolutely love it when my wife tells me something. I can quickly text to Google Calendar and know it will appear our shared family calendar. Here is some helpful reference information from Google how to create SMS text messages that get turned in to appointments. Hey Gmail-ers. Just a quick update on the hosted email instructions. It seems every time I go to host email from one of my domains, the procedure changes a bit. The toughest part was getting started with the FREE hosting. Here’s the first few critical steps to help get you started. Click on the blue button “See details and sign up”. Now, look for the link just under the blue “Start Free Trial” labeled “Standard Edition”. This is the free one. The rest of the steps are pretty much the same as before and walk you through on the screen. If you have questions or problems drop me an email gpodcast at gmail dot com. One of the most interesting new features in the Gmail Labs is called Multiple Inboxes. If you need more information on Gmail Labs, check the Gmail Podcast Archives for plenty of details on what it is and how you can enable dozens of useful features. Multiple inboxes gives you a very nice way to see items that would normally be cluttering up your inbox in separate window panes on the same screen. Combined with labels and filters, multiple inboxes makes for a very powerful organization tool. Begin by enabling the Multiple Inboxes feature under Settings> Labs. You’ll notice your main conversation index now shows a sort of split-screen view of your normal conversation index as well as search results on the right. By default it comes up with search results for starred and draft items. To change this, go back in to Settings and you’ll see a new tab labeled “Multiple inboxes”. There you will see five lines, labeled “Pane 0-4” that you can put in the search conditions you want to display. You can also set a maximum number of conversations you want to display and if you want the panes displayed above, below, or to the right of the inbox. Now, back at your inbox, you’ll see a whole new layout. Using filters, you can immediately label and move messages to their own window for better organization. At the top of each pane you can find a link on the right labeled “View All”. When you click on that link the particular pane will take over and take up the whole index. Be careful not to get carried away with Multiple Inboxes. While they can be a powerful feature to keep you organized, I found the more I tried to configure them with filters, the less organized I became. I thought it would be helpful to take some of my more common messages and bypass the normal inbox by applying them to a label and making them appear in one of the other inboxes. For example, all my incoming notifications from Facebook would simply “appear” in a facebook pane. Unfortunately, there doesn’t seem to be a keyboard shortcut to move me to another pane (yet). Maybe something like g 0-4 would be helpful to allow me to select, label, archive, and delete conversations in those other inboxes. Try out the multiple inboxes and see what works for you. I have to say, I’m rather impressed with some of the other changes in Gmail recently. The user interface has been cleaned up and a couple new features added. The buttons on the main index have been given cleaner look. Archive, Report Spam, and Delete are still there, however More Actions has been divided in to “Move to”, which allows you to apply a label and move the message out of the inbox, and label which simply applies a label. “More Actions” is still available, but has been tidied up to simply include “Mark as read”, “Mark as unread”, “Add to tasks”, “Add Star”, “Remove Star”, “Create an event”, “Filter Messages like these”, and “Mute”. For you keyboard shortcut nerds, “v” activates the “Move To” menu, “l” for the label menu, and “.” (period, or dot) still gets “More Actions”. It’s been a challenge to retrain my fingers, but I’m learning. I’ve got dozens of labels and scrolling is quickly becoming impractical. Another nice feature about these new menu options is auto-complete. As you start typing the label name, Gmail will narrow the search down. Once again, I highly recommend keyboard shortcuts for moving between your messages with j and k, select them with “x”, move or label them with “l”, or “v”, archive them with “y”, or delete them with “#”. Applying labels with auto-complete makes organizing your messages a snap. I can quickly narrow down 100 new messages to 10 that I really need to read and reply to in a few minutes.